Trademark up easing 90 degrees (also called an up-ramp or a concave ramp) made from quality white oak by Richard Burbidge. Fits 32m and 41mm spindles. For use with both post-to-post and continuous over-the-post handrail systems. Very similar to our standard up easing, but extended to allow a full 90-degree vertical turn. 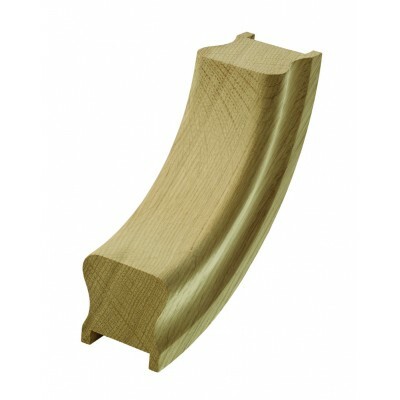 Connects a horizontal handrail or handrail fitment to a vertical handrail or fitting. May be trimmed to fit non-standard staircase pitches that are not suitable for a standard up easing.